There would be another cocktail party, dinner, and performance by the "Creative Source Group" in 'Udhailiyah Tuesday night, so that afternoon I went in a taxi to the airstrip with Trish Miller and Sharon Green, waiting there 45 minutes for the late plane to arrive. Once in 'Udhailiyah though, we all got in a festive mood again at the party at John Cochrane’s with the "Creative Source" entertainers and other Aramcons, then enjoyed their performance by the swimming pool. On a crazy impulse afterward, and because it was another beautiful, relatively cool night, we decided to drive to the tents of another Arab Bedouin family Oran had befriended at the Amine Plant watering trough. So we set out with the Adams, arriving there just after dark, but were still welcomed wholeheartedly by Mohammed. I think they were extremely pleased to have two American couples visit and immediately served dates, coffee and tea. While this was taking place their herd of camels, who gather around the families' tents each night, were being milked. One of the family members brought a large bowl of fresh camel milk to our area and handed it to Mohammed. He took a long drink from it, then handed the bowl to my husband, Oran, who also took a long drink, then passed it on to me. I had never tasted camel's milk before and was reluctant to drink from the same bowl as everyone else, but as the old saying goes, "when in Rome, do as the Romans do", so I followed suit. What a pleasant surprise! Although warm, it had the flavor of cow's milk, but was much sweeter. With reluctance, I passed it on to the next person. When all had finished, Mohammed asked if we would like to see the herds being milked, so we delightedly accepted the invitation. Following Mohammed, carefully weaving our way through the herd, we soon arrived at what seemed to be a central collection area. A large container had been set up there, and as each individual camel was milked, the liquid was brought back and poured into the larger container, until each camel in turn had contributed. There was much laughter and a feeling of camaraderie among the family members and ourselves. It dawned on me then that, with no refrigeration, these people must consume a very large amount of milk and products made from it in each 24 hour period. It had been one of the most interesting and enlightening visits with the Bedouins so far. I had observed a simple, well organized, orderly and enjoyable way of life among large family members that would be enviable in other parts of the world. Mohammed led us back through the herd of camels to our vehicles, where we professed our sincere thanks for his hospitality before our farewells. I was so glad our stay in Arabia had included that night, August 24th, 1976. The next morning, I caught the plane back to Abqaiq with the other wives. On my errands around camp, I saw Sharon Green, then had lunch at Patti York’s. They both seemed to enjoy hearing about the events of the camel milking I had been to the night before. Oran came home from 'Udhailiyah on the afternoon plane, and we had Sheila and Keith Kaul over for pizza. Keith had just gotten back to Arabia from a special business assignment in Florida. We had been invited to visit Ruth and Ken Cummings the first day of that weekend, Thursday, so we caught a taxi to Dhahran at 2 o'clock. 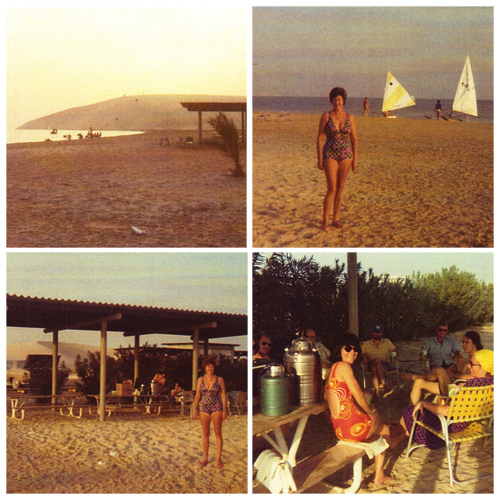 After visiting awhile we rode with them to the special Dhahran beach on the Persian Gulf, called Birdpoint Yatch Club. It was the first time we had been there and we found it enviably beautiful with calm, clear, rock-free, blue-green water, immaculately clean sand with covered picnic tables, and best of all, private. A large sand dune jutted out into the water on the south side, dividing that beach from Half Moon Bay, a most idyllic setting. Birdpoint Yatch Club on the Persian Gulf; Colleen and Oran with other Aramco employees (possibly Arlene Berg). We saw Norm and Barbara Wade and another Abqaiq couple who had a drink with us before they left. Oran and Ken talked business while Ruth and I got the food ready and the table prepared. The main item was grilled American steaks (which were hard to come by in those days), delicious. A most different and relaxing afternoon and evening, but all good things must come to an end, so we returned to Cummings house in Dhahran, then caught the 10:30 bus back to Abqaiq.